Against all the odds, Tiger Woods pulled off one of the great sporting comebacks. 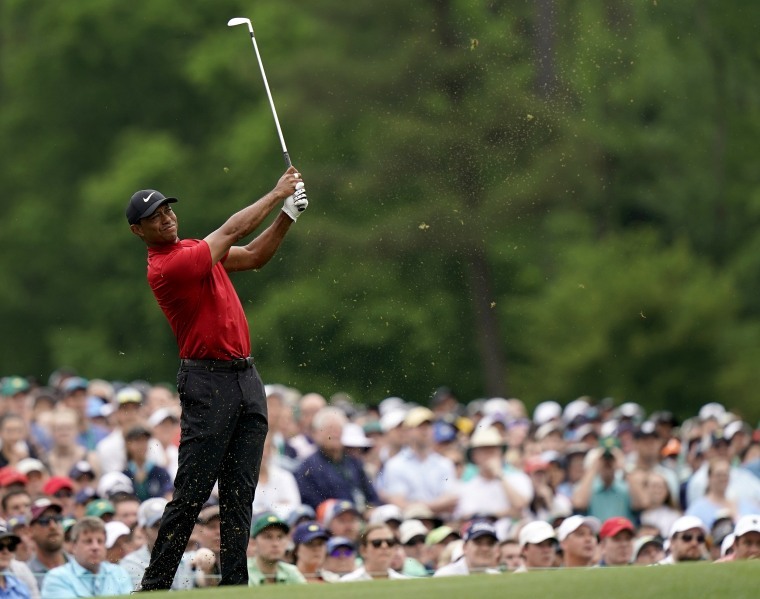 Millions watched one of the great sporting comebacks at the Augusta National as Tiger Woods clinched his 15th major title, his fifth Masters green jacket and first major win since 2008. He had to beat well-documented personal strife and four back surgeries to get back into contention and rescue a career that many thought was over. And there were emotional scenes on the 18th green as Woods embraced his mother and children, echoing the famous image of him hugging his father when he first won the Masters in 1997.It's good news too for Nike, which has stuck by the star throughout his troubles. The Northeast was braced for severe thunderstorms, high winds and possible tornadoes, after storms killed at least seven people in Louisiana, Mississippi, Alabama and Texas over the weekend. Among the dead are at least two children, aged 8 and 3, in Angelina County, Texas. The weather caused violent and chaotic scenes, with one witness telling NBC affiliate WLBT: "I saw a side of a building and a tree fly up in the air and start spinning around." Trump has raised more than the top two Democrat candidates combined. As the 2020 election campaign enters a key phase, it looks like the Democrats will have to work hard to match Donald Trump — at least when it comes to campaign spending. NBC News reports that the president's campaign raked in $30 million in just the first three months of 2019, with the Republic National Committee separately having raised $46 million.That's more cash than the top two Democrat candidates, Bernie Sanders and Kamala Harris, have raised between them. Workplaces are today divided into people who did watch the opening episode of the final season of 'Game of Thrones', people who didn't but desperately don't want any spoilers and those who have little to no interest in the whole thing.But in Northern Ireland, where the epic fantasy series is filmed, it's been huge bonus. NBC News producer Kiko Itasaka reports that some 120,000 fans of the show have made the trip to the tiny nation, bringing in $40 million to the local economy. • Active shooter drills in schools have become an everyday reality but they may be having a negative impact on the children they are mean to protect, prompting schools to try a different approach. • A 29-year-old man was arrested in Dallas Sunday night in connection with the alleged beating of a transgender woman. The city's mayor said it appeared to be "mob violence." • Want to see how long people in your town are likely to live? Here's an interactive map that will tell you. • A student at Fordham University in New York City died Sunday night after falling from a campus clock tower, the school confirmed. • Lyft has pulled its electric bikes from three cities because of problems with their brakes. 'Game of Thrones' is back — but are fans and critics guilty of over-hyping its importance? Why do we get food cravings? And what can we do about it? "To have my kids here it’s come full circle. My dad was here in ‘97 and now I’m the dad with two kids there." — Masters winner Tiger Woods. A strange thing is happening to llamas: They keep disappearing.That's according to an agricultural census last week which showed there were fewer than 40,000 llamas in the U.S., down from a high of 145,000 in 2002.Once a sought-after pet, bought by celebrities and sports stars, they have now fallen out of favor.Some breeders say demand is increasing again, but it's unlikely the llama will see its heyday of the 1980s and 1990s return. Thanks for reading today's Morning Rundown. If you have any comments — likes, dislikes — drop me an email at patrick.smith@nbcuni.com.